Well, at least I know they’re dry. 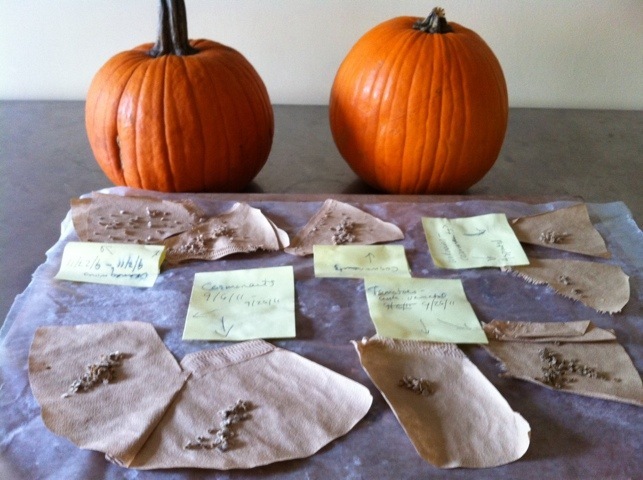 On my unending to do list has been to take these seeds I originally plucked from their fruit in late September, and – now that they’re cleaned and fully dried – put them in their packets for next year. This whole process really only rakes about a week: the first day to pick the fruit you want to replicate, dig your fingers in and draw out the pulp and seeds together, place that glob in a clear glass jar to which you add water (about equal to the pulp/seeds glob). Cover it with cheesecloth or, for those of us who aren’t pretentious or practical enough to keep that hand, paper towel with slits cut in the top. I rubberband the paper towel over a baby food jar, keeping the lid handy for later in the process. Let it sit for a day and collect a thin layer of scum in the top. That next day you spoon that layer off, and give the mixture a good stir. Next, let the whole thing sit (covered or not – doesn’t matter but I do cover mine to keep in the funk). Several days later you should be able to see a bunch of good seeds on the bottom of your jar. You can them just spoon or pour out the water and moldy stuff on top, and what remains at the bottom of the jar are your now sterilized seeds. Clean these well with water in a mesh strainer, set them on wax paper to dry. I check them the next day and roll them around to separate them and make sure all parts are getting dry. In a couple days (or, in my case, the next month), they will be nice and dry, with a little fuzzy protective layer, and ready to store in labeled packets (I use coin envelopes and put the name of the plant, the dates harvested, where I got the seeds originally, and my initials – if you will be exchanging them you should count them and include that as well). Since mine were in the basement, I didn’t worry too much about the fact that it took me awhile to get to them, since my basement is a clean, dry, usually dark area, and that’s just what dormant seeds like. But, finally, they are going to their winter homes today. Thanks, all of you, for joining them on the journey. They told me to tell you, too, to revel on, their fellow revelers! I have a few seeds left I should put away too. Actually, I need to gather them all up and put them all in one place. Right now some are in the basement, some upstairs. Come to think of it, I have a small cardboard box waiting for recycle day that would be a good place to put them all. Hey. Hey. What’s up with the CSA?